This winter, the men’s volleyball team is looking to top their impressive 2016 season, in which the Brewers finished with a 24-7 record. The men competed their way to the semifinals of the United Volleyball Conference before falling to the Stevens Institute of Technology 1-3 at New Paltz. These 24 wins in one season account for the second-best season in Vassar history, with an exception only for the 26 victories that the Brewers earned in 2008. Following this feat, the squad was voted eighth in the American Volleyball Coaches Association Top 15 Poll. Coming back this season, the players are led by new Head Coach Richard Gary, as former Head Coach Rob Wolter left the squad to accept a coaching opportunity at Aurora University in Illinois. Coach Gary has plenty of volleyball coaching experience under his sleeve, as he spent the last five years instructing both men and women’s volleyball at Wells College in Aurora, NY. The players are ready to adapt to new coaching and improve their game even further this season. Their proximity to competing in the championships last season has not been forgotten, and only exacerbates the team’s desire to succeed. A collective goal for the squad this year is to take home the United Volleyball Conference championship win. However, the team possesses skilled returners as well as incoming freshmen, all of whom are determined to offset this loss. “With a smaller roster than most of our opponents, it’s great to have guys who aren’t obsessed with specialization and can adapt when the team needs them to,” appreciated Coach Gary. The Brewers recognize that in order to improve as a whole, they must step into whichever roles need to be filled. “Reno took a lot of swings before he graduated, and now a lot of that responsibility is being transferred to me,” told senior captain Christian Lizana, ready to step up to the plate. “I am trying to take that role in stride and do my best to provide a consistent hitting option that my teammates can trust,” Lizana continued. Lizana finished last season with astounding stats, including 393 service receptions, 131 digs and 146 kills, equating to the fourth most on the team. Cimorelli matches this level of experience, earning all United Volleyball Conference Honorable Mentions both his freshman and sophomore year, and taking home the league’s Libero of the Year award following his junior season. Cimorelli played in 111 sets last year in each of the 31 matches. He posted 90 assists, as well as 263 digs, which earned him the highest on the team, third most in the conference and 32nd nationally in digs per set. 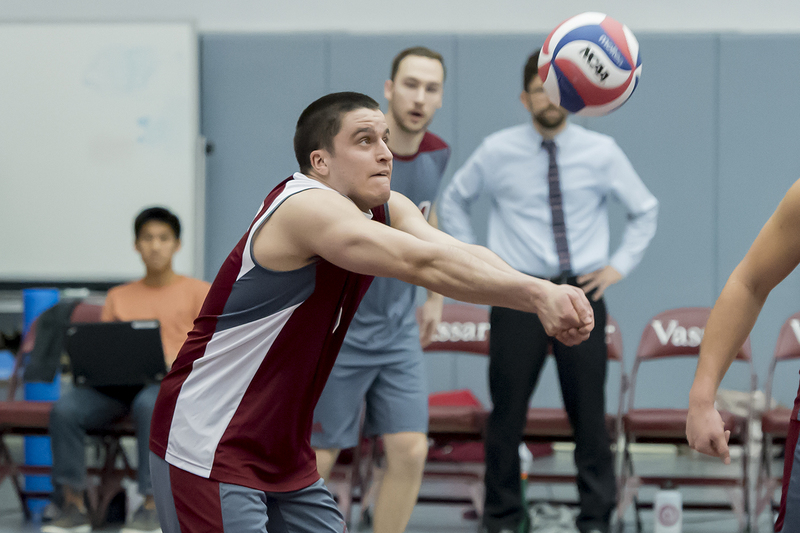 These standout players are joined by junior hitter Matthew Knigge, who has arrived back to Vassar after spending the semester abroad in Russia. Knigge is enthusiastic and ready to contribute to the team’s efforts once again. In his last season, Knigge earned Athletic Volleyball Coaches Association First Team All-American, All-United Volleyball Conference First Team, ECAC First Team and Betty Richey Outstanding Performer of the Year Award. He finished third in the nation in both hitting percentage and blocks per set. Supplementing the returners’ mass of talent, the team’s three freshmen are making themselves known as well. “All three of our freshmen have made a big impact for us so far, each contributing in very different ways,” noted Coach Gary. “Kevin Ros is working incredibly hard and despite moving into a more offensive role, which could have thrown off most defenders, he has really worked to make an impact. Zach Bygall came back from a brutal flu to lead us in the fall and has continued to push hard in that role. Yoni Auerbach has come back from a back injury this fall and is now playing the best volleyball we’ve ever seen from him. It’s exciting to see each of them improve every day,” Coach Gary shared. Next up, the Brewers will face New York University in Springfield, MA on Friday, Feb. 3 at 8 p.m.